Just finished this great book about journaling! Highly recommend it for all of my English teacher friends, those going through any sort of life change (good or bad), and of course to anyone who has uttered the words, ‘I have nothing to say’! Before I read this book: Why on EARTH would I listen to advice about journaling from a 22 yr. old? After I read this book: Wow, she’s write, err… right. 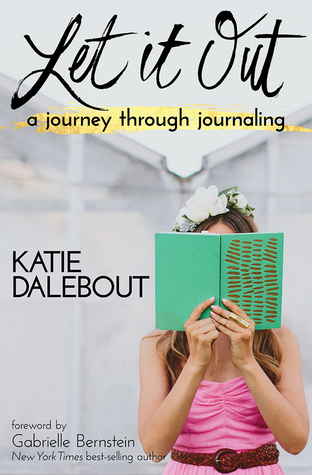 Let It Out by Katie Dalebout focuses on journaling, and not your Dear Diary, pre-teen “I have a crush on this boy” journaling, but the journaling of life. Most importantly, your life. As a high school English teacher, there’s nothing more joyful, more heart-warming than the orchestral groans of thirty teenagers when I utter the words, “Let’s WRITE today!” When asking teens why they hate to write, the answers are usually 1: It takes too long. 2. I have nothing to say. 3. My hand hurts. While I can’t help the inevitable carpal tunnel that is the demon of English, I can alleviate the first two. Dalebout’s book delivers the same, on a unique, easy to follow, spiritual level. For adults, for teens, men, women, old young. The beginning reads as a get-to-know-you of Katie (I feel I can call her Katie after this journaling journey. We’re on a friend level now, yo) and what drew her to writing. This is the portion where I wanted to draw a skeptical eye to discover why this young person with half my life’s experience is qualified to dish ME advice. There’s always something about reading how others flourish that angers the self-help reader. The fact is – the author has figured it out. You’re reading the book because you haven’t. Sit tight, hot mess. This young ‘un has something to say that might pique your brain taters. What’s magical about this section was that I found myself nodding. I’ve experienced “aha” moments in life. I’ve faced adversity. Instead of critiquing her 1990 birthdate, I accepted that she was lucky to discover herself at an early age. Katie’s struggles include bullying and (poignantly) an eating disorder, as well as universal, been-there-done-that angst of the early 20’s “finding yourself” period after college and the stress of finding a job and feeling confident and secure in that position. I would recommend this book to anyone going through a difficult time – one of change or adversity, or even upon something exciting like receiving a promotion. The psychology of adjustment exists for a reason, change is problematic. Through journaling, Katie illustrates ways to cope. I also recommend this to teachers of English looking for interesting prompts for classes in order to answer the “I have nothing to say” students. As I tell my students – you are the only you. I can’t write you. Write like you have something you want to tell the world about you. These prompts, with some small adaptation for some would work extremely well. Perhaps my only constructive critique is that I thought some parts overflowed into the realm of flaky, such as suggesting that one can cure acne either holistically or through Western medicine by simply believing in a method. The likelihood is that by relaxing and letting go of anxiety, stress is decreased, and thus the body reduces acne-causing chemicals. The suggestion would be insulting to someone with a serious disease such as cancer, that by mere belief, a cure is imminent. Certainly the medical community would provide proof that mere belief isn’t always enough. However, if the reader can overcome some metaphysical slant, the journaling itself can proof vastly therapeutic and the exercises are enjoyable, revealing, and often at times, revelation-provoking. Thank you to NetGalley and Hay House for a copy of this book in exchange for an honest review. This entry was posted in Books, Journaling, Writing and tagged Journaling. ← Pinterest Cake? NAILED IT! !